To most people Burma is on the other side of the world. It is sandwiched between India-Bangladesh, China, and Thailand. I have gone there seventeen times for my church. Since I collect foreign coins, I look for Burmese coins when I have time. There are no dealers with shops like we have here and in Europe. In the tourist market there are stalls or booths about eight feet wide and twenty feet deep. None deal exclusively in coins but there are two which have a good selection of Burmese antiques and some coins. One of these, owned by Shwe Kyaw [not his real name], has only genuine antiques, while the other has a mixture, but will tell you which is really old and which are recently made for tourists. Other stalls might have a few coins in a dish along with stamps and notes. Since it is technically illegal for tourists to buy old coins, they are out of sight but they will show them to you if you ask. All speak enough English to do business. There are also some antique shops with coins at two other locations in Yangon (Rangoon) but their selection is rather pitiful. Most say Shwe Kyaw has purchased all their good coins, as he regularly makes the rounds to these shops. So I end up buying most of my coins from him. He is about retirement age and knows Burmese coins well. He has a display of Burmese coins that is rather extensive and maddening, because they are not for sale. He only sells his duplicates. He knows what is scarce and his prices are not steals but are fair for the rarity. I have purchased two coins from him listed as "rare" with no value given. I got to know him fairly well over the years. I asked him how many serious numismatists there were in Burma, a country of 45 million people. He thought a while, mentally counting them, and said four or five others. He invited me to his home for dinner and had his son pick me. I thought he had lots of coins at home he wanted to sell me but I soon found out he just wanted to show me some of his prized pieces plus some very rare Burmese antiques. I got the feeling he really enjoyed talking with someone who appreciated what he had and does not press them to buy them. The Burmese meal was delicious. The Japanese forced the Burmese to accept their paper occupation money during WWII which was issued in huge quantity and seems to be in every antique shop. While usually I see the same old tired British India and smattering of very common world coins over and over again, there are times when interesting hoards show up. One time they were demolishing a hundred year old buildings in the downtown area and a hoard of George V 10 Rupee notes was found under the roof. Apparently the hoard had been secreted at the start of World War II but the owner never returned for them. Most were water damaged and discolored. I bought a few. I still see them on every trip so they must not sell well. One time I found about a dozen 1917 British India Uncirculated 2 anna coins at a reasonable price. They are the only uncirculated silver British India coins I have ever seen in Burma. This last time I found some uncirculated ¼ anna George V bronze coins in a tray with pure junk. They were beautiful but not cheap. Another time I stumbled upon a street market which apparently only operated on Saturday nights. Small dealers would spread out a cloth and display their old stuff on it. I thought they were really optimistic that someone would buy any of their junk. 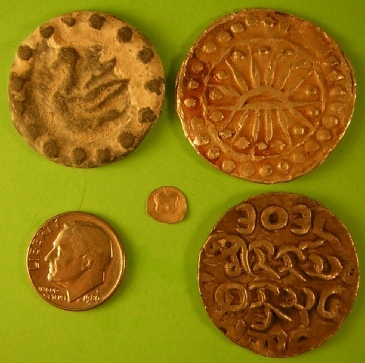 But I did find several counterfeit ¼ anna bronze coins from British India. When they were made, a rupee was 33 cents and there were 12 annas to a rupee so these had a face value of ½ cent. It hardly seems worth the effort to counterfeit a ½ cent coin! Since it was illegal for them to be selling without a license, they could quickly grab the corners of their display cloth and gather up their merchandise and flee when the police came wanting bribes to leave them alone. The most common foreign coin in Burma and Thailand is the counterfeit 1804 U.S. silver dollar in nickel. They seem to be everywhere and always with a good story. Most do not believe me when I tell them they are worthless. Another time I found in a shop a very large lead coin 73 mm across and weighing 14 ounces. At that time I hadn’t seen M. Robinson’s book, The Lead Coins of Pegu and Tenasserim, so I didn’t know if it was a coin or a weight. I bought it on speculation and it turned out to be a good buy. Another time I viewed some coins at a shop but they were overpriced. After I left, a man followed me and invited me to his apartment of view his coins. I followed him up a narrow, dark stair shaft wondering if I had made a big mistake. It did turn out he had a big lot of revenue stamped paper which I bought and a CMA medal from WWII. This medal was issued in error when a message from the marauders with CMA in it was interpreted as meaning Citation for Military Assistance when it really meant comma! One hundred were issued and they are quite scarce. He wanted $200 for it without its ribbon. I regretfully declined. Outside of Rangoon coins can sometimes be found at the stalls at pagodas. Pegu, now called Bago, which in ancient days was Pyu, has stalls that have lead coins from 500 AD to about 1,000 AD. It is a matter of luck if you find any coins in Taunggyi, Inle Lake, Mandalay, or Bagan. I have purchased less than a dozen from these locations in seventeen visits because they mostly have worn out British India and 1948-90 Burmese coins which they value at a much higher price than they are worth. While one will never get rich buying coins in Burma, it is an interesting place where one can turn up unlisted early coins. The people are wonderful and friendly. Top left: Kingdom of Pyu lead coin 500-800 AD, bird left. Top right Kingdom of Funan, silver 190-550 AD, rising sun. Bottom Right: Sanda Thudhamma Silver 1652 AD Burmese writing. U. S. Dime is reference as to size. 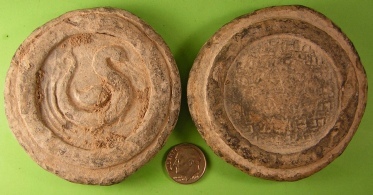 Second photo: Lead Coin or Weight from Tenasserim.